(Nanowerk News) Carbon is not only the source material for all organic chemistry and life on Earth but also utilized in numerous operating or new technologies. The versatile bonding of carbon leads to several stable architectures offering original electronic, optical, mechanical or thermal features. Thus, pure diamond, for example, is an excellent electrical insulator, while graphite materials are more or less good electrical conductors, depending on their composition and pre-treatment. As carbon and graphite foams are very good thermal insulators, even at very high temperatures, diamond, on the other hand, is used for heat sinking in electronics, due to its very high thermal conductivity. In several advanced technologies (electronics, optics, optoelectronics, etc. ), carbon-based nanomaterials contribute to a wide variety of applications. This is the case of graphene in pristine or oxidized forms offering several functional materials such as hole transporter in photovoltaics or as transparent or flexible electrodes in electronics. The intrinsic electronic features or those related to doping or defects contribute critically to the physical responses of carbon-based nanomaterials. These effects may be exhaustively characterized by the Electron Paramagnetic Resonance (EPR) technique providing also detailed information on the local environment and electronic peculiarities of the defect structure in carbon-based materials. Thus, EPR is a powerful and sensitive method to detect active intrinsic and extrinsic paramagnetic defects in this class of materials. In particular, EPR a suitable tool to detect spin density changes in different nanocarbon architectures and can contribute to improved understanding of electronic coupling effects in those materials. In carbon-based materials, EPR spectroscopy does not only provide insights into the spin properties, which includes conduction electrons, unpaired spins, and dangling bonds but also enables investigations of electronic states in different forms of carbon. All those carbon-inherited EPR-active centers affect the electronic and optical properties of the host materials and their understanding is crucial in improving the operation efficiencies of carbon-based devices. In this context, among the relevant experimental methods devoted to carbon-based materials studies, there is a lack of specialized books focusing on EPR properties of modern carbon-based materials including their nanosized architectures. "Electron Paramagnetic Resonance in Modern Carbon-Based Nanomaterials", is a new book which attempts to fill the abovementioned void by compiling key contributions for researchers interested in the electron paramagnetic resonance study of the carbon-containing thin films, nanomaterials, ceramics, porous materials, etc. The book comprises 13 chapters on topics of high importance in the field of electron paramagnetic resonance study of modern carbon-containing nanomaterials. The topics and authors were selected from recently published papers in highly cited journals. 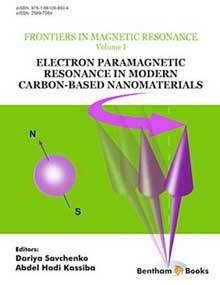 The book represents various topics in the field of EPR study of carbon-containing nanomaterials. The main aim of the eBook is to give the reader the experimental and theoretical approach for the analysis of paramagnetic centers (dangling bonds, interface defects, vacancies, and impurities) usually observed in such modern carbon-containing materials as nanographites, graphene, disordered onion-like carbon nanospheres (DOLCNS), single-walled carbon nanotubes (SWCNTs), multi-walled carbon nanotubes (MWCNT), graphene oxide (GO), reduced graphene oxide (rGO), nanodiamonds, silicon carbonitride (SiCN) and silicon carbide (SiC) based composites and thin films. – Application of multifrequency EPR to the study of paramagnetic defects in α-Si1-xCx:H thin films and α-SiCxNy based composites. The book is available in both digital (eBook) and printed versions.